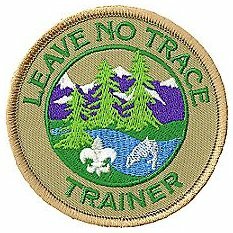 Description: The Leave No Trace Trainer teaches troop and patrol members the principles of Leave No Trace, improves Scouts’ outdoor ethics decision making skills, and helps the troop and patrol to prevent avoidable impacts and minimize unavoidable impacts from their use of the outdoors. Comments: The Leave No Trace Trainer specializes in teaching Leave No Trace principles and ensuring that the troop follows these principles on outings. He can also help Scouts earn the Leave No Trace award. He should have a thorough understanding of and commitment to Leave No Trace. Ideally, he should have completed Leave No Trace training. 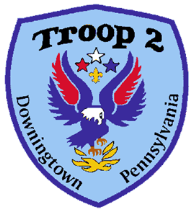 Training: You must attend the troop Junior Leader Training even if you have attended in the past. The Scout must also successfully complete the 16-hour minimum nationally recognized Leave No Trace Trainer training course to get credit for the position and receive the Leave No Trace Position Patch . A Scout who has not completed Leave No Trace Trainer training will get credit as an Instructor teaching Leave No Trace skills and will start by wearing the Instructor patch. Ensure the troop follows Leave No Trace principles on outings. Help Scouts earn the Leave No Trace award. Have a thorough understanding of and commitment to Leave No Trace principles. Completes Leave No Trace Training. Instruct Leave No Trace Program as needed within the Troop or patrols. Take on assignments from the staff to provide skills instruction at Troop meetings and on campouts. Prepare well in advance for each Leave No Trace instruction assignment. Study carefully the skill to be taught. Talk with the ASPL (Programs) each week to be sure of your assignments. Tell him if you are having trouble preparing for your instructional assignments.